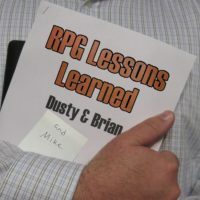 On this episode of RPG Lessons Learned: Dusty takes his ETU game off-script, and runs an 8/10 ETU game for the guys! That’s two good sessions in a row! What are we suddenly doing right? RPG Lessons Learned 067 – Lessons Learned from Caleb Sundsted’s West Marches campaign! On this episode of RPG Lessons Learned: Caleb from Sounds Like Crowes Podcast returns to discuss lessons learned from his West Marches Campaign! On this episode of RPG Lessons Learned: Dusty and Mike interview Caleb from Sounds Like Crowes Podcast who discusses the thirty-player West Marches campaign he GM’d!